If Palestinian master bombers are any guide, militant groups should be able to produce basic device architecture and BOM (bill of materials) with variants tailored for local conditions. (For example, being able to substitute and wire a CDMA phone in lieu of a GSM phone.) These plans could be accessed electronically and implemented locally. It addresses what colleagues have spoken to me as the ‘holy grail’ of an attacker coming in clean, then building the device locally from locally sourced components that do not attract attention. While bomb-making instructions are easily available on the internet, it is a skill that needs personal tuition... "If you don't have proper training in chemistry, engineering and the processes of building a bomb, you're just guessing..."
Skills needed can include the refrigeration or heating of chemicals to a precise temperature, mixing chemicals to an exact proportion, or understanding the degree of concealement needed to smuggle a substance through an airport scanner. "It is an ongoing problem for militant groups. This is why some [groups] often sent the detonator or a key part of it back with those it was deploying to carry out attacks, especially for the more sophisticated attacks." Too many gloat over the ineptitude of the Times Square bomber. 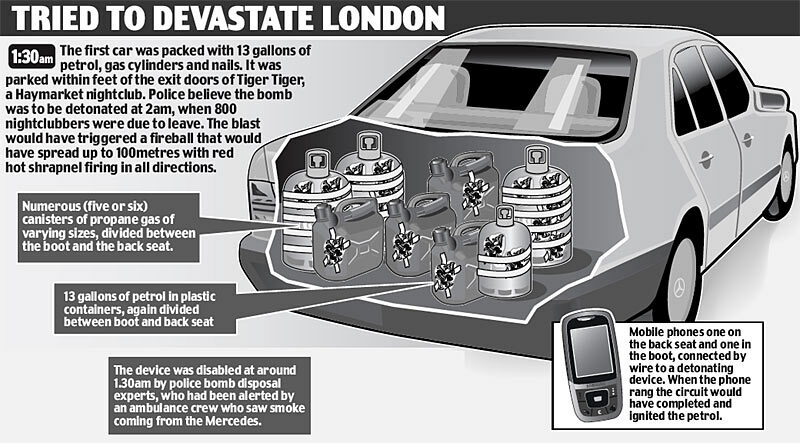 With a better designed device - amateurish was appropriate to describe that one - and/or an actor that was willing to die rather than escape, much of what followed would be post blast forensics. 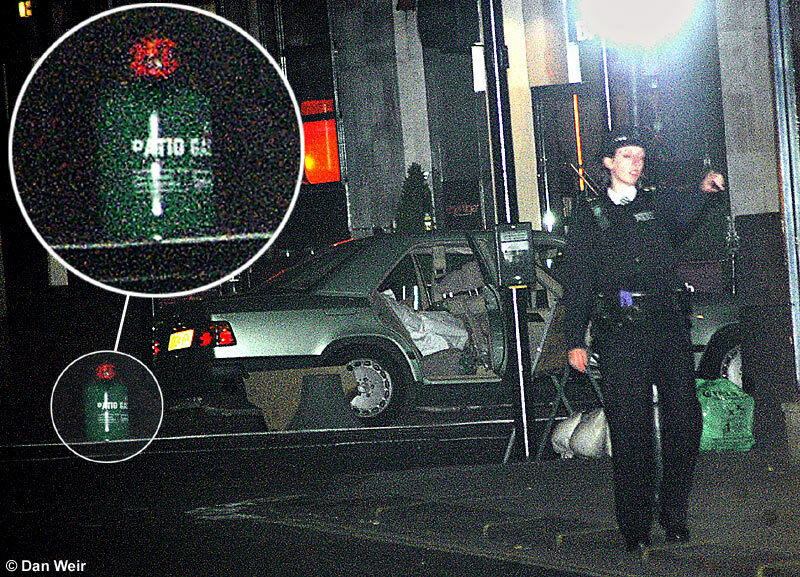 The Time Square failure is even more remarkable in that improvements to the basic design of the 2007 London car bomb outside the Tiger Tiger club in Haymarket, and a second car a few hundred yards from the first, were not disseminated among the faithful. See diagram and image. Investigators found that the vehicle identification number (VIN) on the dashboard of the 1993 Nissan Pathfinder had been removed. But that's not the only place to find the VIN. According to AutohauzAz.com it can be found: Left side of dash (thru windshield), front left floor panel, right inner fender, right strut housing, firewall, and engine block. I decided to bet that I could capture a working preparation library for explosives, incendiaries, igniters and basic device constructions in less than 30 minutes. The goal was to have sound operational materials that with a modicum of laboratory practice and mechanical and electrical skill would produce operational devices. The process took less than 20, and that was with citation documentation. Start with likely keywords or phrases, or if you know anything about the field, start with a classic: FM 5-25 Explosives and Demolitions. FM 5-25 is devoted to placement technique as opposed to manufacture, but wherever FM 5-25 appears there will be fertile ground. My paper copy is 1971; subsequent changes are minor. Second search tip is to limit searches to PDF documents as most manuals are rendered in PDFs on the web. Third search tip is, when you find a promising item, rerun your search limiting your search to that domain. Leaving aside the many Torrent feeds and the occasional scribd.com sources, you will soon have PDFs of all that you need for technical preparation from ordinary materials as well as mechanical fabrication and placement. The citations noted here are representative, but not exhaustive. Some sites could be, or should be, honey pots. Other than Cryptome, most English sites represent themselves as patriot, militia, or survivalist stock. The items cited in Preparer Resources below are but a sampling of technique available on the web. The next question was why, with these materials easily available, weren't the jihadist community producing better device designs for export. Despite the volume of information that is publicly available, mercifully much of which is wanabee, actual fabrication has been poor in many recent devices in the US, UK and Europe. Readers may think that, 'It is only a matter of time. They cannot stay stupid forever,' but the truth is that the necessary information has been in jihadist, paramilitary, and patriot right hands for decades. My only surprise is that so much tradecraft appears to have been lost in jihadist training over the past decade. The documents — including student notebooks, instructor lesson plans, course curriculums, training manuals, reference books and memorandums — show that one tier, by far the busiest, prepared most of the men who enlisted in the jihad to be irregular ground combatants... The other provided a small fraction of the volunteers with advanced regimens that prepared them for terrorist assignments abroad. American military instructors who reviewed the documents said the first tier of instruction was sophisticated in a conventional military sense, teaching, one said, "a deep skill set over a narrow range" that would reliably produce "a competent grunt." The second tier was similarly well organized, albeit with more sinister curriculum. To instill these diverse lessons, the schools applied ancient forms of instruction — teachers pushing students to copy and memorize detailed tables and concepts — to modern methods of killing. [in effect, using] "Islamic pedagogy to teach Western military tactics." One camp, used by the Islamic Movement of Uzbekistan, gave instruction in movements by four-man fire teams that was modeled after formations used by the United States Marine Corps... The Uzbeks also used reconnaissance techniques long taught at the Army's Ranger School in Fort Benning, Ga. Other documents show that jihadi explosives training covered devices and formulas lifted from a Special Forces manual published in 1969. While these materials are available through open sources, from on-line booksellers to rural gun shows, military officials said it was a feat to digest far-flung sources, translate them into Arab and Asian languages and assemble them in an orderly way. Bomb-making instruction, for instance, combined the electrical engineering necessary to make detonation systems with Vietnam-era Army formulas for home- brewed explosives, then was translated into Arabic, Uzbek and Tajik. "It indicates a tremendous amount of filtering and organization to get to that," an American military instructor said. "One of the problems we had against the Soviets was getting the mujahedeen to be uniform," said an American official familiar with that movement. "We couldn't get them on the same page. When you went to one valley, they fought one way. When you went to the next, they fought another. To the extent these guys were able to level the training and make it consistent, they were on the right track." But officials also noted that the breadth of the camps' curriculum search resulted in uneven quality. Some material was well- chosen, some not... Officials also said even useful references could be problematic. One said that while cautious handlers could use some Special Forces bomb recipes, others would endanger themselves. "People have had to be scraped off of their ceilings after trying these things," he said. The jihadis seemed to know this. One notebook warned: "Make sure that first aid kits are available at all times in order to deal with any mishaps that might result from the performance of this experiment." Signs of this collection effort are sprinkled throughout their documents. American military trainers who reviewed the jihadi students' notes quickly identified lessons from their own playbooks, including Islamic Movement of Uzbekistan reconnaissance techniques also used by Army Rangers, or four-man weapon deployments and formations — wedges, columns, echelons, lines — that are the Marine Corps standard. Again, why isn't the current jihadist community able to produce better device designs for export? I believe that answer lies in both denial of sanctuaries and predation on jihadist human resources. In other words, the number of skilled instructors was severely reduced with the balance redirected to operational roles. Likewise, the traning infrastructure was degraded, reducing the available training syllabus and hands-on field work. That will change once they absorb the lessons of the master bomber. A guide to the most critical readings on Afghanistan and Pakistan. The Islamic groups training recruits in Afghanistan managed to standardize their lessons, bridging ethnic and linguistic divides to ensure that all the soldiers had a similar base of knowledge. The student notebooks, taken from different camps and safe houses, show nearly identical diagrams in lessons like map reading, compass training, basic demolition and weaponry, as in the sight for a rocket-propelled grenade, explained here in Uzbek, Tajik, Arabic and Urdu. described as “the military series” related to the “Declaration of Jihad.” The manual was translated into English and was introduced earlier this year at the embassy bombing trial in New York.